I’ve said it before and I’ll say it again: if I ask for books for my birthday or for Christmas, it’s because that’s all I want, or at least that there’s nothing I want more. Sure, they’re not fancy or expensive, but I don’t want fancy or expensive things—and if I do, I’m not going to ask someone else for them (usually). But I already buy myself too many books, so asking for those is really just a way to enable my addiction further. So…I guess use your judgment when buying me books. But of all the things I could be addicted to, books are probably one of the least bad, right? Right? That last paragraph — YES! I say this to my husband all the time. I may buy a ton of books and not read them all but there’s worse things I could compulsively purchase. I feel your pain! My own family is pretty good in general about feeding my habit but there is usually some sort of, “Are you sure that’s all you want?” response. 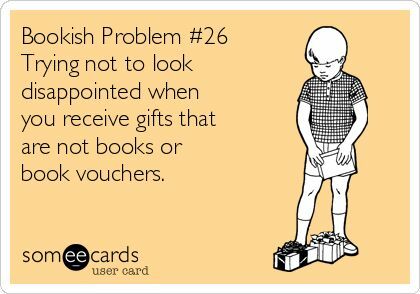 My bday is coming up and I’ve tried – oh, how I’ve tried – to think of other things to add to the wish list, but it’s still mostly books.